ICTF's Symposiums in the U.S. and Europe are known as the 'best in the industry' - the most superb educational and networking events for international credit management professionals - a forum for sharing of experience and exchange of best practices, providing unique practical insight and actionable ideas, real-time business intelligence, quality interaction and expert perspectives. Whether you are an experienced credit pro or new to the industry, attending the ICTF symposiums is a tremendous opportunity to learn from and network with leading practitioners in the field. Members save over $400 on symposium registration fees annually. "The educational content and intellectual capacity contained within ICTF is outstanding." "ICTF Symposiums bring together some of the most sophisticated international credit professionals, which creates an extraordinary environment to share and learn the latest global credit practices." ICTF members enjoy full complimentary access to this essential country risk ratings service (annual savings of over $1,000). Click here to access a Country Risk Ratings File, which is updated monthly, and can be downloaded and used internally as part of your risk analysis and scoring models. Click here to request a sample country report - succinct one-page country analysis. ICTF's Weekly Country Updates arrive in your email box every Friday! They include valuable information for international credit management professionals - a concise review of major political and economic developments worldwide! Find solutions to specific issues and challenges - post a question on the ICTF Online Member Q&A Forum. Connect with your peers and tap into the collective knowledge of the ICTF membership. You will be amazed at the breadth and depth of global credit management "know-how." Access member-shared resources, sample documents, presentations and survey results. Semi-Annual Global Payments Benchmarking Surveys and On-Demand Member Surveys - contribute to and get valuable data from the ICTF community through participation in surveys on hot topics. Members receive access to survey results to benchmark their companies, enhance their knowledge and guide their strategies. With ICTF's Educational Webinars and 2-hour crash courses you get the best education delivered by the most experienced international credit and trade finance professionals, without leaving your desk. Educate your entire credit department at no additional cost. Most of the webinars are offered for free to ICTF members (annual member savings of at least $750). ICTF/Thunderbird 8-week online courses in International Credit and Trade Finance - acquire vital knowledge and accelerate your career by earning the RGCP (Registered Global Credit Professional) and CGCE (Certified Global Credit Executive) credentials. ICTF/Thunderbird certifications give you the skills and knowledge to propel your career to the next level. ICTF Credit Reports can help you make informed business credit decisions! These are the best quality business credit reports at the most competitive prices - freshly investigated - worldwide coverage - no contracts - pay as you go. ICTF serves as a vital on-site training resource - we provide programs tailored to your needs with content customized based on your requirements and your staff's experience. Emerging credit professionals gain access to ICTF's content-rich educational training and a global network of experienced international credit and trade finance professionals who are available to provide guidance, support, and mentoring. Keeping you in the know, and providing information that is relevant to the international credit and trade finance professionals in their daily job duties. 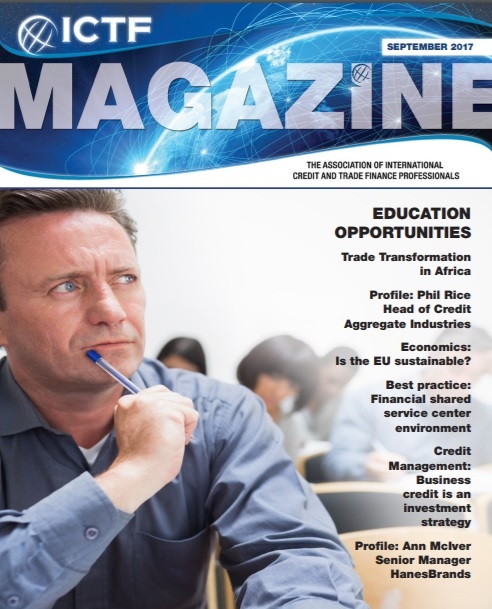 These electronic publications offer educational columns, member profiles, and other valuable news. Download a sample copy and make sure you are a member of ICTF for full access to the ICTF Member resources.